Push back pallet rack systems provide a very desirable combination of high density storage and pallet accessibility. The storage density equals that of drive-in pallet rack systems, yet every lane can be accessed at all times. The gravity storage system for bulk goods can be stored on pallets according to the last in first out principle (LIFO). Pallets are pushed back by the next incoming pallet. Any lane can be filled from the aisle without affecting any other adjacent lanes above or below. The push back racking system also known as dynamic pallet racking is where pallets can be stored two, three, four or up to 10 pallets deep. The pallets are loaded and unloaded from the same aisle reducing truck travel distances and improving efficiency. Once a pallet is picked from the pick face, the rest roll forward automatically under a controlled speed. The system is an ideal solution for warehouses with palletised products and can be used for a wide variety of product types and mixed rotation. The structure is made from certified high-strength steel and has a durable powder coating, meaning that it is rigid, reliable and safe. The height of the racking and the aisle measurements are made to suit specific characteristics of lifting devices, pallet size and the dimensions of the warehouse itself. Push back racking provides all of the density of the drive in system without having to drive into the rack keeping damage to a minimum. It provides the best use of available space and saves time in storage and extraction operations. Push back racking can be located against a wall for a single-sided system where only one side is accessed or in a centre aisle for double sided access. Up to 75% increase in storage capacity. Fully demountable and can be relocated at a later date. Fast construction, with minimum disruption. Seamless integration into existing environment. Makes use of existing available vertical space. What type of Industries use the push back racking system? Before any installation takes place it always best that a method statement and risk assessment is carried out. The erection of your racking may fall within the Construction Design and Management 2007 regulations therefore, it is important that this is adhered to. Independent verification is recommended to ensure the floor is of a suitable construction as well as being able to sustain both the weight of the racking and the goods it will hold. In addition it is also important to verify that the floor is suitable to securely floor fix pallet racking, in line with the manufacturers requirements. It is important to consider the safe use of plant or access equipment as specified by ‘The Provision and Use of Work Equipment Regulations 1998’, and should only be operated by a suitably qualified individual. Any operation should be carried out in line with the appropriate manual handling regulations. Again, the racking should only be erected externally if the design has first been approved by your pallet racking supplier. The pallet racking should be levelled to the appropriate SEMA/FEM design code and the uprights floor fixed as specified by the manufacturer. All construction must be assembled in accordance with the manufacturer’s instructions. Please note the importance of the relative guidelines when erecting and levelling pallet racking. Are you looking for timber decks for pallet racking to allow for varying pallet sizes or storing various boxes crate and other items on pallet racking? Here are 2h Storage solutions we supply tens of thousands of timber decks for pallet racking every year. We offer a wide range of deck options and also provide chipboard and mesh decks in all sizes including pallet flue guard separators for use with in rack and other types of sprinkler systems. We offer open and closed boarded timber decks in both rough sawn and planned finished options. Made to fit your bay and level sizes with the timber thickness and deck design specifically manufactured for a wide range of loadings from 1000kg timber decks, 2000kg timber decks, 3000kg timber decks and heavy duty specials. We also offer a supply and install option with weekend working available to help minimise disruption to busy warehouses. In fact here at 2h Storage we offer a complete pallet racking solution for all types of racking offering products like rack upright guards, anti-collapse mesh, new and used spares. With a full range of services from CAD drawing, site surveys, inventory of storage equipment and identification, designs and build for pallet racking, mezzanine floors, partitioning and a wide selection of warehouse equipment. So for top quality timber decks fast and cost effective, or any other warehouse and racking requirements call our design team here at 2h Storage Solutions for a FREE of charge site SURVEY. Do you have high volumes of stock and need to achieve maximum storage density in your warehouse could drive in pallet racking be the best solution? Here at 2h Storage solutions we have installed hundreds of pallet racking projects of various types of equipment and are experienced in drive in pallet racking installations, push back and multi-tier solutions. Unlike conventional APR or adjustable pallet racking Drive in Pallet Racking is far more technical to design and install and requires both experienced designers and experienced pallet racking installation teams. We specialise in larger and more complex pallet racking and warehouse equipment solutions including two tier picking systems and conveyor installation. We provide full CAD drawings and manage the entire process including building regulation approval if required. If you are looking for drive in pallet racing in Yorkshire, why not give us a call and speak to one of our project managers to discuss your project. We will advise you on the best solution for your business needs. Even pallet racking does not last forever particularly if it has suffered some knocks and bumps along the way. Customers often ask us what is the best type of pallet racking of course different manufactures racking does have differing designs and some are better for certain applications and budget requirements. If you have older pallet racking like Dexion P90 or HiLo KS it is probably worth considering a product like Link51 which is not only manufactured here in the UK in Telford one of the centres of UK engineering but also readily available. You can buy new Link 51 pallet racking and used Link 51 pallet racking easily we supply both new and used and specialise in this system and its design. It has many advantages particularly when it comes to cost effective repairs solutions as the products design is very versatile. So whatever pallet racking you currently have its worth considering Link 51 as a sensible replacement racking system. Are you looking for leasing pallet racking in Yorkshire to avoid large capital expenditure? Then call 2h Storage today for great designs, advice and leasing pallet racking deals. When you are moving warehouses or looking for storage equipment solutions there are usually other costs like forklift trucks or moving costs so why not minimise your capital out goings by leasing your pallet racking. We also specialise in gravity feed and automated pallet and carton systems, mezzanine floors and all you will need for your new storage equipment project. We offer a free site survey and expert advice on all types of storage equipment from simple plastic boxes to automated delivery systems so call the experts here in Yorkshire today for a quotation we will not be beaten of price for a like for like specification. We design supply and install top quality new and used pallet racking to some of the regions biggest names in warehousing, distribution and manufacturing. If you need advice on design, installation and supply of new or used racking in Yorkshire call the experts here at 2h Storage. We offer a full and comprehensive range of quality products which saves you time and money searching a variety of suppliers and allows us to pass on our buying power and give you composite savings. We offer a full design, drawing, installation or simply supply only with new or used racking delivered direct to your site. So for all your new and used racking call 2h storage today. Do you have existing pallet racking or shelving but are unsure of the safe working loads? Or are you looking to move pallet racking and are unsure of the suitability of an existing warehouse or yard floor slab? You need to talk to 2h Storage, unlike many other racking companies we can provide pallet racking shelving loadings and structural calculations for floor slabs, mezzanine floors or buildings where racking or shelving will be used on ground floors, first floors or above. Bay loads, overall weight loads and point loading all require careful consideration. The first consideration is the pallet racking loadings these include the UDL per pair of beam then the bay load this is the loadings that the frames and base plates will take. Then you need to consider the overall loads being placed on the slab, floor or structure that the racking or shelving will be placed on. One of the most important and also most overlooked considerations is the point loading that will be placed on the floor where the pallet racking or shelving baseplates are located. This downward compression force can cause sinking, fractures or even collapse to the floor slab or structure below the pallet racking or shelving. If you need any information of structural calculations relating to storage equipment pallet racking and shelving call our storage equipment design team on 01765 640 160. Do you need external galvanized pallet racking or external galvanized cantilever racking? Here at 2h Storage we offer a complete storage solution and can provide a wide range of cost effective options for external storage. Do you have large bulky long or palletized loads you need to store safely externally? We have a selection of products and solutions for external pallet, crate and long load storage. 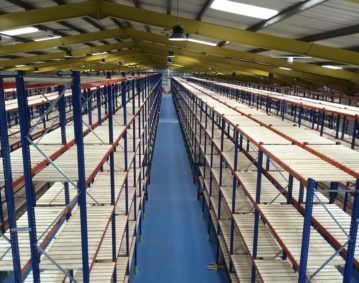 Are you looking for standard pallet racking or cantilever racking we can design, supply, install, repair and inspect both internal and external racking of all types and manufactures? Do you need a one off bespoke solution for storing long items or large items? Give us a call at our warehouse in Yorkshire and we will visit your site carry out a free of charge site survey and advise you on the most cost effective racking options. Whatever your product, timber, steel, or plastic we can provide vertical, horizontal and pallet racking products to give you the best use of your internal or external space. Do you need a temporary building we can advise and rack out temporary buildings providing layout drawings for pallet and cantilever racking? So whatever type of external galvanized cantilever and Pallet Racking for outside Racking storage you need call the racking experts on 01765 640 160. If you are looking to alter your existing beam levels in your pallet racking or change the pallet racking beams there are a few things you need to know. Firstly and most importantly is the pallet racking you are altering safe? If you have any doubts or your pallet racking does not have a load notice attached to each individual run of pallet racking you should consult a competent pallet racking company. They will advise you on if a pallet racking safety inspection is required to check your current pallet racking system is suitable and in a safe working condition with the appropriate load notices. Secondly and very often missed by the end user of the pallet racking is the height of the first beam level. This is the measurement from the floor to the height of the bottom of the first beam level. This measurement is used in the design and specification of the pallet racking and is critical to the loadings and application that the pallet racking can safely take. So if you plan to increase the height to the first beam level you must consult a competent pallet racking company who will be able to advise you on how this will affect the pallet racking systems loading capabilities. If you are adding additional beams you need to know they are correct for the system you have and will take the loads you will place on them. This can be calculated using the beams depth width and section detail but again should only be done by an experienced pallet racking designer. Never use beams without the correct safety locking pins or clips and never ever bolt pallet racking beams into position as they are designed to pop out during an impact situation to minimise risk of a total collapse. Finally be aware that falls from pallet racking or items like beams or products falling from pallet racking can kill make sure these alterations are only carried out with qualified pallet racking installers using the correct equipment and risk and method statements. If you have any doubts about changing pallet racking beams and beam levels give our pallet racking design team a call here at our offices in Yorkshire.